More than 50 unpublished poems by Rudyard Kipling have been discovered by a US scholar. Thomas Pinney found the manuscripts in a number of places including a Manhattan House that was being renovated and among the papers of a former head of the Cunard Line. Pinney described it as a "tremendously exciting time for scholars and fans". The poems will be published alongside 1,300 others in the first ever complete edition of Kipling's verse on 7 March. 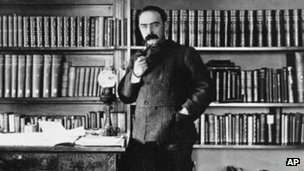 Kipling, who lived from 1865 to 1936, was best known for his fictional short stories including The Jungle Book and poems Mandalay and If. The newly discovered poems include several from World War I, including one titled Never Again In Any Port, as well as notes from a journal the writer kept on a tour of the war graves of Belgium and France in 1924. Pinney, a professor of English at the University of California, said: "Kipling has long been neglected by scholars probably for political reasons. His texts have never properly been studied but things are starting to change. "There is a treasure trove of uncollected, unpublished and unidentified work out there. I discovered another unrecorded item only recently and that sort of thing will keep happening." One poem from 1899 comprises a diatribe against media intrusion titled The Press, which was one of Kipling's pet hates, echoing present day worries. He wrote: "Had you friend a secret / Sorrow, shame or vice - / Have you promised not to tell / What's your lowest price? / All the housemaid fancied / All the butler guessed / Tell it to the public press / And we will do the rest." There was also Kipling's comic verse, including an example written on a ship sailing from Adelaide to Ceylon, Sri Lanka, which is thought to have been read aloud by Kipling to those around him. "It was a ship of the P&O / Put forth to sail the sea," he wrote, going on to show his frustration with the pace of the liner. "The children played on the rotten deck / A monthly growing band / Of sea-bred sin born innocents / That never knew the land." Linda Bree, arts and literature editorial director at Cambridge University Press, said: "Kipling's If is one of the most popular poems in the English language, but this edition shows that he wrote much else to entertain, engage and challenge readers." Kipling was born in Mumbai, India, and moved to England with his family when he was five years old. For much of the 20th Century, his reputation was damaged by his jingoistic imperialist views, with George Orwell describing him as "a prophet of British imperialism". Poetry excerpts courtesy of The National Trust for Places of Historic Interest or Natural Beauty.